· Birmingham International Dance Festival returns to the city 1 – 24 June 2018. · Expect fantastic dance in the city’s theatres and a takeover of Birmingham’s streets and squares with show-stopping performances from dawn until dusk. · Produced by Birmingham-based DanceXchange, working with a rich network of partners. Birmingham International Dance Festival (BIDF), produced by Birmingham-based DanceXchange, working with a rich network of partners, returns to the city from 1 – 24 June 2018. Expect fantastic dance in the city’s theatres and a takeover of Birmingham’s streets and squares, with show-stopping free performances and opportunities to get dancing. This festival will bring the best of international dance to the city and provide a platform for local talent to shine. The programme will excite and delight a wide range of audiences and participants, inspiring local people, and attracting visitors to the city. BIDF celebrates Birmingham as a young, diverse city, a place where anything is possible, where the extraordinary happens in the most unexpected spaces. The 2018 festival programme is inspired and curated around themes of imagination and digital art and reflects on the diversity of dancers’ bodies. It will present work that shows choreographic practice at its best and pushes the boundaries of dance as a contemporary art form. Alongside the performance programme will be a series of professional and industry events, debates and workshops, creating a valuable space for dialogue, collaboration and sharing of ideas, as well as skills development. Make sure you put the dates in the your diary and visit www.bidf.co.uk to keep up with the latest news and programme announcements. · Atomos by Company Wayne McGregor at New Alexandra Theatre on 1 and 2 June. This is a rare opportunity to see this celebrated choreographer’s work outside London. Anticipate a beautiful exploration of movement, film, sound and light – where the audience wear 3D glasses for part of the show. · Continuing the digital theme, Guide by Vera Ondrasikova & Collective makes its UK premiere at The Patrick Studio on 8 and 9 June. Guide is an absorbing audio visual experience in which the past and present become one, as the performer sculpts light watched by an audience immersed in electronic music. 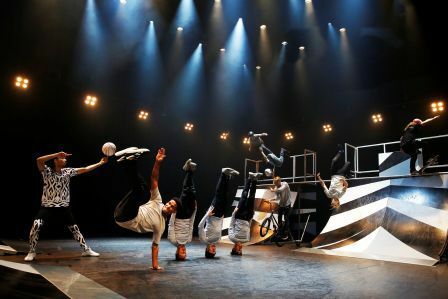 · Challenging the notion of what can be presented on a traditional stage, on 14 June ISH Dance Collective will bring vert ramps and extreme sports to the stage of Birmingham Hippodrome in Elements of Freestyle. A UK premiere, the show will feature a dynamic fusion of live music, dance and theatre with break dance, inline skating, free running, skateboarding, BMX and freestyle basketball. · Midlands Arts Centre will host a festival family weekend on 16 and 17 June, bursting with an exciting indoor and outdoor programme for children and families to participate, create and watch dance. The highlight is the unmissable Kindur by Company TPO, a magical interactive theatre experience for 5–10 year olds. The whole audience can join in an adventure with the Kindur (Icelandic for sheep) as part of a larger flock, either from their seats or on stage, as their movement triggers sounds, images, music and colours. · As part of the festival’s focus on the diversity of dancer’s bodies, renowned veteran dancer and choreographer Rui Horta, whose audacity and doggedness has propelled him to get back to the stage after thirty years of absence, presents a deeply personal performance of Wasp at the Patrick Studio on 15 and 16 June. Candoco Dance Company, celebrated for cutting edge work that challenges and broadens perceptions of art and ability, will make a rare visit to the city on 13 and 14 June at Midlands Arts Centre with their double bill by Yasmeen Godder and Hetain Patel. · From 15 – 23 June, Birmingham Repertory Theatre in association with BIDF 2018, presents the world premiere of Woyzeck. Woyzeck is a celebration of fighting for a better life when everything else seems to be against you. Most of all it's a celebration of the West Midlands spirit as a stellar professional cast is joined by a community chorus of one hundred performers and dancers choreographed by Rosie Kay. · An exhilarating triple bill, In The Upper Room by Birmingham Royal Ballet, 20-23 June, includes a new innovative choreographic work. The festival outdoor programme will transform Victoria Square, in the heart of the city, with a rich and exciting programme, sponsored by Colmore BID, that includes interactive performances, participatory events, and live music and performances from local and international talent. There will also be interactive VR swings, light and sound installations and sensory technology sculptures. Local foodie favourites and roasters, as well as healthy juice stalls, will create a fresh and vibrant festival atmosphere right on your doorstep. · Opening the Festival Square on 1 June is Morning Gloryville, the original morning ravers. The event, part exercise craze, and part mass party, is a city premiere in collaboration with firm favourites from the local music scene and a big headline DJ, to be announced soon. · Under the title of Birmingham Dances, the opening weekend 2 and 3 June will kick-start the outdoor festivities with a special programme of performances, participatory activities and playful interactive installations, interweaving dance, fitness and movement activities from local talent; featured spectacles such as Marawa The Amazing and her Majorettes, and much more to be announced. · A special programme celebrating the best of Midlands dance talent takes place 4 to 8 June – supported by Dance Hub Birmingham, featuring an open stage showcasing a range of lunchtime and early evening presentations and a number of special commissions reflecting the festival’s themes. Also animating the square will be captivating multi-disciplinary artists and local DJs; morning yoga and mindfulness activities, bringing that outdoor summer vibe. · D-Construction, a high octane hip-hop dance performance with a powerful beat by Compagnie Dyptik, challenging our perception of borders, questioning the profound nature of social links in the public space. What unites us? What separates us? To what extent are we able to question territories, borders and institutions? · Challenging head on the perceptions of a dancer’s body, Compagnie Didier Theron present the UK premiere of Air, a bold and playful performance where four dancers are dressed in inflatable latex suits which transform and magnify their movements. They will be bouncing into unexpected places around the city centre. · Ofir Yudilevitch’s Gravitas is a breath-taking duet combining dance and acrobatics performed on an air floor mat. The performers explore the elemental force of gravity, playing with it in one moment and in another becoming pure mass, surrendering to its blind will. BIDF’s outdoor touring strand which will visit different parts of the city, spreading the festival vibe to neighbourhoods that may not often see dance – funded by Dance Hub Birmingham. Watch out for the spectacular Origami, an elegant large-scale performance which will be wowing audiences at outdoor locations around the city between 22 to 24 June. Satchie Noro and Silvain Ohl, were inspired by the ancient art of Japanese paper folding to transform a 40-foot shipping container into a shape-shifting performance space. The full programme of events will be announced over the next few weeks. BIDF 2018 is produced by DanceXchange, and is funded by Arts Council England and Birmingham City Council, with additional investment from Dance Hub Birmingham. The Festival Square is sponsored by Colmore BID. BIDF is proud to be part of Birmingham’s Year of Movement.